Lara Spencer has been co-anchor of “Good Morning America” since 2011, working alongside Robin Roberts and George Stephanopoulos. Back in 2004/2005, PBS viewers will have seen Spencer hosting the hit show “Antiques Roadshow”. The furniture chain IKEA was founded by Ingvar Kamprad in 1943, when he was just 17-years-old. IKEA is an acronym standing for Ingvar Kamprad Elmtaryd Agunnaryd (don’t forget now!). Elmtaryd was the name of the farm where Ingvar Kamprad grew up, and Agunnaryd is his home parish in Sweden. The deltoid “muscle” is actually a group of muscles, the ones that cover the shoulder and create the roundness under the skin. The deltoids (delts) are triangular in shape resembling the Greek letter delta, hence the name. Shea Stadium in Flushing Meadows, New York was named after William A. Shea, the man credited with bringing National League baseball back to the city in the form of the New York Mets. Shea Stadium was dismantled in 2008-2009, and the site now provides additional parking for the new stadium nearby called Citi Field. When the surface temperature of much of the Pacific Ocean rises more that half a degree centigrade, then there is said to be an El Niño episode. That small temperature change in the Pacific has been associated with climatic changes that can stretch right across the globe. El Niño is Spanish for “the boy” and is a reference to the Christ child. The phenomenon was given this particular Spanish name because the warming is usually noticed near South America and around Christmas-time. If you check the can, you’ll see that “Mountain Dew” is now marketed as “Mtn Dew”. The great northern loon is the provincial bird of Ontario, and the state bird of Minnesota. The loon once appeared on Canadian $20 bills and also appears on the Canadian one-dollar coin, giving the coin the nickname “the loonie”. Starfish (sometimes known as “sea stars”) come in many shapes and sizes, but commonly have “pentaradial symmetry”, meaning they have symmetrical body-shapes with five points. Most starfish are predators, mainly living on a diet of mollusks such as clams and oysters. Prior to 1945, the island that we know today as Taiwan was called “Formosa”, the Portuguese word for “beautiful”. Portuguese sailors gave the island this name when they spotted it in 1544. The official name for the state of Taiwan is the “Republic of China”. The formidable politician Angela Merkel was first elected Chancellor of Germany, the country’s head of state, in 2005. She is the first female German Chancellor. When she chaired the G8 in 2007 she became only the second woman to do so, after the UK’s Margaret Thatcher. Merkel grew up in East Germany under Communist rule. Erma Bombeck wrote for newspapers for about 35 years. She produced more than 4,000 witty and humorous columns under the title “At Wit’s End”, with all describing her home life in suburbia. In geographical terms there are three “Easts”. “Near East” and “Middle East” are terms that are often considered synonymous, although “Near East” tends to be used when discussing ancient history and “Middle East” when referring to the present day. The Near/Middle East encompasses most of Western Asia and Egypt. The term “Far East” describes East Asia (including the Russian Far East), Southeast Asia and South Asia. The Arabian Peninsula is shaped like a boot, with the Sultanate of Oman occupying the toe of that boot. The term “box office” may date back to Shakespearean times. In those days long past, patrons would deposit fees for seeing theater performances in boxes. The full boxes would be collected and placed in an office called, imaginatively enough, the “box office”. “Selma” is a 2014 film about the Selma to Montgomery marches of 1965. Directed by Ava DuVernay, the movie stars David Oyelowo as Martin Luther King, Jr. and Tom Wilkinson as President Lyndon B. Johnson. In 1935, businessman Charles Lubin bought a chain of three bakeries in Chicago called Community Bake Shops, and soon expanded the operation into seven stores. Lubin introduced a cream cheesecake that he named after his daughter who was only 8-years-old at the time, Sara Lee Lubin. The cheesecake was a hit and he renamed the bakeries to Kitchen of Sara Lee. The business was bought out by Consolidated foods in 1956, but the brand name Sara Lee persists to this day, as does Ms. Sara Lee herself who now goes by the name Sara Lee Schupf. The male peafowl is known as a peacock, and the female a peahen. The peafowl’s young are sometimes called peachicks. Bottlenose dolphins have a very large brain to body mass ratio, second only to humans among mammals in general. Along with the brain-size comes high intelligence. Many dolphins have been trained to carry out military tasks. And then there is their acting ability, as exemplified by “Flipper”. “Elle” magazine was founded in 1945 in France and today has the highest circulation of any fashion magazine in the world. “Elle” is the French word for “she”. “Elle” is published monthly worldwide, although you can pick up a weekly edition if you live in France. “Ciao” is Italian for “‘bye”. “Arrivederci” is more formal, and translates as “goodbye”. Irene Cara co-wrote and sang the Oscar-winning song “Flashdance… What a Feeling” from the 1983 movie “Flashdance”. Cara also sang the title song for the 1980 movie “Fame”, and indeed played the lead role of student Coco Hernandez. Two of the plants that are most painful to humans are poison oak and poison ivy. Poison oak is mainly found west of the Rocky Mountains, and poison ivy to the east. They Might Be Giants is an alternative rock band that formed in 1982. The band’s name is lifted from the 1971 movie of the same name starring George C. Scott. Amstel is a Dutch beer and brewery that was founded in 1870 in Amsterdam. The brewery takes its name from the Amstel river that runs through the city. In Act I of William Shakespeare’s “Julius Caesar” a soothsayer warns the doomed emperor to “beware the ides of March”. Caesar ignores the prophecy and is subsequently killed on the steps of the Capitol by a group of conspirators on that fateful day. The phrase “mum’s the word” has been around since the early 1700s. “Mum” has been used to mean “silent” for centuries, the idea being that “mum” is the sound made when the lips are tightly sealed. L’Oréal is a French cosmetics company, and indeed the largest cosmetics and beauty company in the world. Here in the US, L’Oréal runs a “Women of Worth” program that honors women who volunteer in their communities. Maybelline was founded in 1925 in New York by a chemist who was inspired to produce a line of mascara when he noticed his sister applying some makeup. The young lady was using a mixture of Vaseline and coal dust on her eyelashes to make them appear darker and fuller. He produced a product in the laboratory that had a similar effect and started to sell it. The sister’s name was Maybel, and Maybelline became the new company name. The ceramic known as “porcelain” can be referred to as “china” or “fine china”, as porcelain was developed in China. Our word “chutzpah” meaning “nerve, gall, impudence” is derived from the Yiddish “khutspe”, which has the same meaning. The Andes range is the longest continuous chain of mountains in the world. It runs down the length of the west coast of South America for about 4,300 miles, from Venezuela in the north to Chile in the south. The highest peak in the Andes is Mt. Aconcagua, at an elevation of 22,841 feet. Interestingly, the peak of Mt. Chimborazo in Ecuador is the furthest point on the Earth’s surface from the center of the planet. That’s because of the equatorial “bulge” around the Earth’s “waist”. Etsy.com is an e-commerce website where you can buy and sell the kind of items that you might find at a craft fair. Didn’t get RASH or OPART. KEpt trying itcH or oucH. I think it’s difficult for C.C. Burnikel to turn it down for Monday. She’s excellent for Thursdays. surrounding letters made it work. Fun and doable, no agony or stress. 9:22. 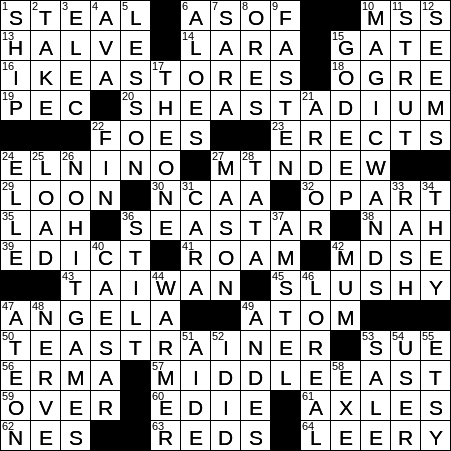 Back from Spring Training and this was a good way to ease back into crosswords. Had “gate” for 2D “Box office income” initially. Also had “itch” before RASH. Good thing this was a Monday puzzle. LAT: 5:54, no errors. Newsday: 5:40, no errors. WSJ: 8:32, no errors. CHE: 13:37, no errors, but I missed a cute gimmick in the very center of the puzzle and went with one of the two possible solutions. BEQ: 28:09, no errors; couple of rough spots in that one. New Yorker: 49:14, no errors; a bit distracted by lots of interruptions, so my time shouldn’t be taken too seriously, but I did pause over a few entries that now make complete sense, but did not come readily to mind. And … I did get Friday’s WSJ meta (though there wasn’t much doubt about that, as the gimmick was one vanishing likely to occur by chance). LAT: 4:11, no errors, after searching some time for a typo. I wonder if there’s such a thing as getting “jitters” over something like this. WSJ: 6:07, no errors. Newsday: 4:59, no errors. Shocked as this one was hand-written. CHE: 9:24, no errors, but missed the Schrodinger gimmick in the center too. Always miss those. Always a joy to see you post. As for others looking over my shoulder, I really don’t have that simply because people have a way of “begging out” over these puzzles being too hard (how do they know? They haven’t even tried), and then most of the time I have them in good enough time anyway. So I really don’t have conditions where anyone would look. Such are things. I notice there’s a lot more people posting through the week than they do on Sunday. Is there a particular reason why this might be? Just the idea of the bigger puzzle, or the perception that it’s harder because the Saturday one is hard? Or another reason? New Yorker: 27:07, 1 error off a bad guess that ultimately looked sort of dumb to me in the end. BEQ: 25:14, no errors. Nothing awfully strange, but I had to guess at things more than I really should have to as a solver. For me I do the puzzle from the daily newspaper but the Sunday paper for my area doesn’t carry the puzzle. So I don’t get to do it. But I do read all the comments about it. 6:19, no errors. One quibble: another damned ETSY sighting. I had a good time with this puzzle …. just the thought that it is a Monday seems to give me plenty of extra confidence.